MBDA has successfully completed firing trials of Meteor, the missile that will be carried by the Dassault Rafale, Eurofighter Typhoon and Saab Gripen. MBDA has successfully completed firing trials of Meteor, the missile that will be carried by the Dassault Rafale, Eurofighter Typhoon and Saab Gripen, and the company is now preparing to start production. The collaborative effort by six European nations has been nine years in development but has produced a beyond visual range air-to-air missile (BVRAAM) that is “vastly superior to anything else in the market,” according to chief engineer Andy Bradford. 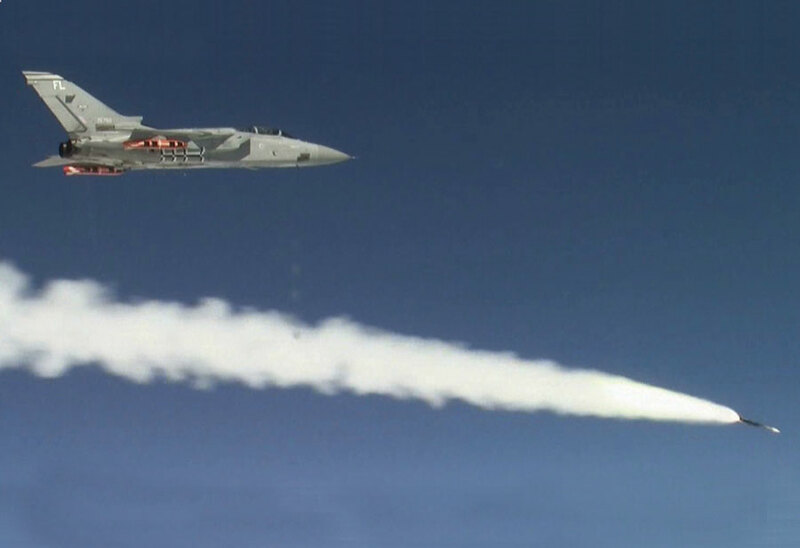 When it received the development contract at the end of 2002, MBDA was set the task of producing a missile with a “no escape zone” that was larger than any other AAM, specifically the Raytheon AIM-120 AMRAAM. This has been achieved by combining a clever boost-ramjet propulsion system with an active radar seeker derived from MBDA’s Aster and Mica missiles. According to Bradford, control of the propulsion system gives the Meteor a decisive edge. He explained that compared to current medium-range AAMs, the booster on Meteor is smaller but the missile sustains a high cruise speed throughout the intercept sequence, and may even accelerate as it closes on the target. The weapon’s electronics and propulsion control unit (ECPU) calculates the appropriate cruise speed depending on the launch condition and the target’s altitude, and adjusts the ramjet’s air intake and duct covers accordingly. The distance that the Meteor has to fly is unknown as yet–the target may be maneuvering, for instance. The ECPU monitors that distance and the missile’s remaining fuel. When the range to go indicates that the missile won’t run out of fuel if it accelerates, the throttle is fully opened to maximize the intercept speed. If the target is at maximum range, there will be little if any acceleration. “The aim is to turn all of the fuel into speed by target intercept, but not before,” Bradford explained. “The Meteor’s reach and supersonic speed dominates the engagement space,” he continued. For the first time, MBDA has detailed the long and painstaking process of ground and air tests that has brought the Meteor to production-ready status. The contract included staged payments that were made only when certain milestones were reached. The Meteor first got airborne in 2005 on a Rafale launched from the aircraft carrier Charles de Gaulle. But the seven early demonstration firings were all done from a Gripen on the Vidsel range in Sweden, starting in 2006. These flights were from the Gripen’s rail launcher. They were followed by four tests of the ejector launcher on a Eurofighter, at various altitudes and g-loads. Having flight-tested various intercept profiles, MBDA defined the changes required in the next batch of missiles–the preproduction standard. The first of these guided firings (GFs) was from a Gripen in mid-2009 in a snap-down, tail-chase engagement. That tested the seeker against background clutter. Then came five ejector-launched GFs over the Hebrides range in northern Scotland from UK Royal Air Force Tornado F.3 interceptors operated by QinetiQ. GF2 was a tough test of the missile’s ability to snap-up through thick air in a tail chase. GF3 then tested high-altitude performance, GF4 was a longer snap-down tail chase against background clutter and GF5 was a high-speed head-on engagement at “well in excess of 100 kilometers,” said Bradford. The Meteor’s actual maximum range is classified. Finally, GF6 was another long-range and head-on engagement in March-April of this year that fully tested the missile’s data link to and from the launch aircraft. Bradford noted that the targets for all except GF5 were high-subsonic Mirach drones with a radar cross section “equivalent to a real-world fighter,” according to Bradford. GF5 engaged a BQM-167 drone. “All the targets conducted a final evasive maneuver,” added Bradford. There have since been three more firings from the Tornados over the Aberporth range off the coast of Wales, to test the Meteor’s performance against countermeasures (chaff and jammers). MBDA admitted to setbacks in the test program. A total of 21 firings were required to achieve the 16 successful ones described above. For instance, just one incorrect line of new software code defeated the first attempt to demonstrate GF3, by causing the location data transmitted from the aircraft to the missile to be misinterpreted. GF4 had to be re-flown after a telemetry problem, and so did GF6 after a connector/cable problem prevented the motor from igniting. “There were no short cuts in this development, we had six nations watching us all the time,” Bradford noted. The last three firings on the Aberporth range were all first-time successes and direct hits, he added. The warhead and seeker have yet to be tested in combination, but Bradford is confident that enough firings have been conducted. “We’ve collected vast amounts of data to prove the model,” he said. Interspersed with the firings have been more than 40 captive-carry flights to test the seeker and a host of ground trials. These included structural and reliability testing, more than 100 warhead firings by Bayern Chemie in Germany and intensive munition trials to satisfy the French authorities that the Meteor could go to sea with the naval Rafale. The missile must be able to withstand 1,000 hours of airborne captive carry (although the motor must be changed at 500 hours). What comes next? MBDA has already delivered some ground-handling training missiles from its factory in Lostock, Scotland. That site will carry out final assembly for all six nations, once they have signaled final acceptance. MBDA expects them to do so by the end of the year. Only Germany has yet to confirm a production contract. The first integration firing from the Gripen has already been completed, and live captive-carry trials have been flown on the Rafale. Those warplanes should be carrying the Meteor in operations by 2015. As for Eurofighter, the main integration contract has not yet been finalized, which could delay the projected UK in-service date of July 2015. MBDA has just finished work on a preliminary contract with Lockheed Martin to study how Meteor will fit into the F-35’s internal weapons bay. Wind tunnel tests to study the airflow around the bay doors as the missile is ejected will be next. The UK’s first operational F-35s will carry AMRAAMs, but the Meteor is scheduled for the stealth fighter’s Block 4 software release. MBDA reports significant export interest in the Meteor. The U.S. has no equivalent–unless a secret (“black”) program is under way. Operational analysis conducted by the company suggests that a fighter firing the Meteor is six to eight times more likely to survive an air-to-air engagement against a representative threat than one equipped with a currently available medium-range AAM. However, it remains to be seen whether the European governments that sponsored the development will be willing to share Meteor’s advanced technology with many other countries.